My German Shepherd Puppy Ruger is growing Like a Weed!! His ears were up and now they are down again, but from what I am reading here and there I am not to worry because he is starting to teethe and this is common. Than you so much for sharing the great picture and information with us all about your "little" German Shepherd puppy, Ruger. He is definitely one handsome little fellow! And you are absolutely correct about the ears - as long as he is teething they will be in so many positions and postures you won't be able to keep track of them all with out a excel spreadsheet!! LOL! And these babies, they do grow like weeds - so expect him to be close to 90 pounds or so by the time he is a year old. It is actually quite amazing to see the changes over time so take a lot of pictures along the way because he won't be a little puppy for long. So expect a lot of changes in your German Shepherd puppy over the next few years - his body is in one constant state of upheaval, but what a handsome young man he will be because he already is right now, don't you agree?! Ruger is definitely a cutie! So, continued success with your German Shepherd puppy. Maybe you can send us some more pictures somewhere down the line. I know we would all love to see them! 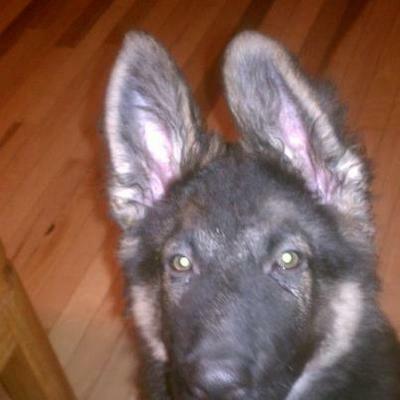 Comments for My German Shepherd Puppy Ruger is growing Like a Weed!! He's so pretty! I like them when they have more black on them. My Jessie was mostly black as a pup but she's lost a lot of it. She is also growing like a weed - 7 months and 65 pounds. But so much fun!! "Your Puppy Ruger Growin Like A Weed"
First let say Congrats on your baby Ruger, he is Adorable and oh, that little face! Puppies are wonderful so slow down and enjoy this time for they grow so fast and this time next year he will big. German Shepherds are Amazing, they are so Protective it doesn't matter if they are female or male, they will Protect! Mia our Shepherd is just that Protective and she is always at our side, she goes to mommy to daddy and vice versa. Take care of you boy and he will take care of you!